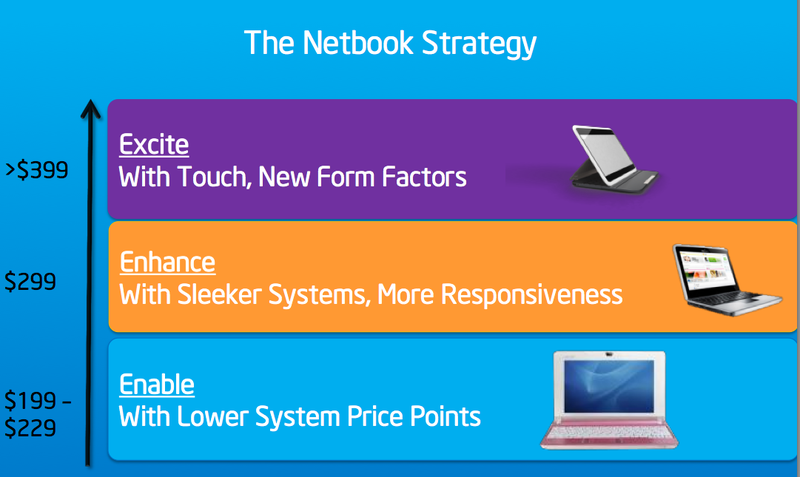 Netbooks aren't dead, but they're not quite the hip topic of discussion they were a few years ago. The focus on cost conscious computing hasn't changed since the introduction of the first netbook, but the maturity of tablets has. Intel still sees the netbook segment as a profitable one (for itself) through 2012, although I'm fully expecting the line between netbook and convertible tablet to blur after the launch of Windows 8. Atom has been at the heart of nearly all netbooks since the segment's inception. We've seen only one major platform shift since then: from the original 2008 Atom platform to Pine Trail. Pine Trail integrated the GPU and memory controller without significantly changing the Atom architecture. Today Intel is officially announcing its next major netbook platform shift: Cedar Trail. 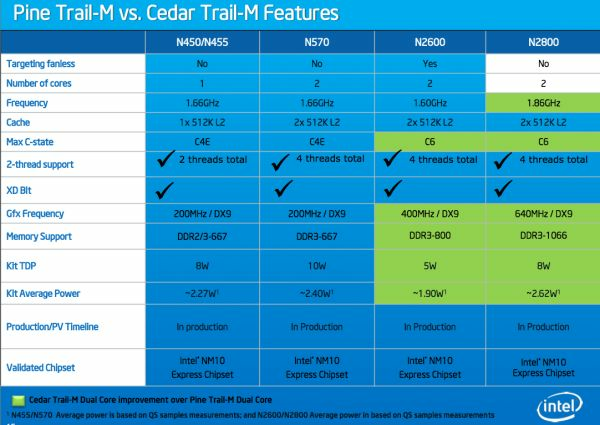 While the original Atom and Pineview (Pine Trail's Atom) were built on Intel's 45nm process, Cedar Trail moves to 32nm. Cedar Trail's SoC shrinks to 56mm2, finally making it smaller than AMD's Zacate APU. The underlying CPU architecture hasn't really changed, nor have cache sizes (512KB L2 per core) or clock speeds (1.66GHz and 1.86GHz parts available), so what this is really about is a reduction in power consumption. There are three Atom CPUs being offered as a part of Cedar Trail: the N2600, N2800 and D2700. Just as before, the N-series are for netbooks while the D-series are for desktops. All of the Cedar Trail Atoms are dual-core parts, but they all slot into the same power envelope as the old single-core Pine Trial platforms (5 - 8W). The only exception is the D2700 which is a 10W platform. 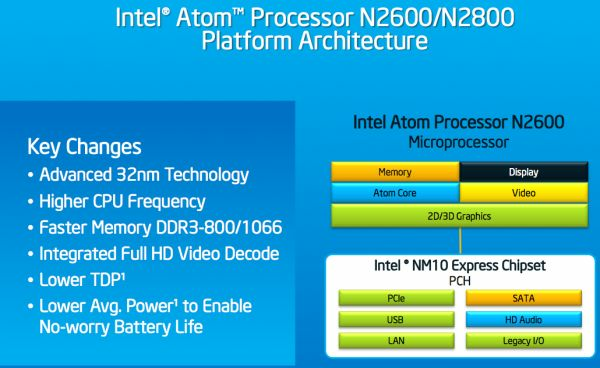 Note that this is the total TDP for the Atom SoC + the NM10 Express chipset (providing USB, LAN, PCIe, etc...). Given the same number of cores and the same clock speeds, CPU performance shouldn't go up compared to Pine Trail. Since everything is now dual-core we should see a boost at the low end, but I wouldn't expect to see CPU performance that's better than Zacate. Cedar Trail now supports DDR3-800 and 1066 (up from 667MHz max data rates before). The bigger change is the GPU. The GMA 3150 used in Pine Trail was an Intel Gen graphics derivative (45nm GMA 3100), however Cedar Trail now features a PowerVR SGX 545 sourced from Imagination Technologies. At 640MHz in the N2800, we've never seen the SGX 545 run at anywhere near this clock speed before so it'll be interesting to see how well it performs. Intel is claiming a > 2x GPU performance improvement compared to the GMA 3150 in Pine Trail in 3DMark 06. The big question is Windows driver maturity, but we'll find out soon enough as systems based on Cedar Trail are in production now and are expected to ship in early 2012. Expect to see Cedar Trail netbooks from ASUS, Acer, HP, Lenovo, Samsung and Toshiba for starters. Intel is expecting the vast majority of Cedar Trail netbooks to be sold in the $199 - $229 price point. At $299 is where you'll likely find features like WiDi as well as potentially fanless designs. Don't expect any of those new form factors at $399 until the later part of next year, likely coinciding with Windows 8's release. Overall the addition of HD video decode support and lower power consumption are both nice features to have, but I'm skeptical as to whether this will be enough to carry Intel based netbooks throughout the majority of 2012. Atom is in dire need of an architecture update (something we'll get in 2013) and the netbook as a platform is in need of a refresh. I do hope to see some manufacturers taking risks with slim, fanless Cedar Trail based designs next year but we'll have to wait and see if they're any good. well, I was hoping there would be gain in performance, but as all is the same, a netbook may last 1 month in battery, if all runs slow it won't matter. I have an Acer running second gen Atom and Vista, and it has no hurry whatsoever to do anything. Brazos is a big winner for mobile. Of course, since Intel is sponsoring much of teh ultrabook development, they'll have a huge spot anyway. Still, I look forward to a comparison between cedar trail and brazos. Since "Krishna" and "Wichita" seem to have been canceled (http://en.wikipedia.org/wiki/AMD_Fusion), to be replaced by a version with an "enhanced bulldozer" core, I wonder how will the competition be in 2012. I have an E350 (on an HP DM1Z) and could not be happier. Well, no, I could: power is never enough, but it is lightyears from the older Atoms. While the ones that going to use N2600 and N2800 are going cost below $240. Not sure why people comparing two products with two different price range and TDP. Well. That is a reason I got MSI Windpad 110w with AMD APU. Upgraded Toshiba slow SSD with Adata 60 Gb one and now this thing is a blast. With HDMA I connected this thing to 46" LCD and it is a great player 1080p. No Atom can touch it (did I say it last about 4 hours on battery).